**Ex-ninja tackles The problem with Movie Geeks and Homophobia! **Movies Silently celebrates the women of silent movies! **Pre-Code falls for the spectacle of The Miracle Woman! **Beth Watkins from Beth Loves Bollywood interviews Samit Basu on his new book Turbulence at The Cultural Gutter! **TwoDudeReview covers the Box Office Surprises of 2013! **Direct to Video Connoisseur makes the connection. The Miami Connection! **Trash Film Guru wishes This Is The End meant the film never started! Can’t Stop the Movies cries “Ball!” on 42! **Turban Decay dishes on The Sheik! **Knights of Mars Roundtable takes a Long Dream off a short pier! **shadowsandsatin educates us on Alan Ladd and Veronica Lake! **Teleport-City gives a hand to Arahan! **Here is an awesome essay on The Act of Killing! **There is going to be a live-action 009-1 film called 009-1: The End Of The Beginning. Mayuko Iwasa will star. Trailer at the link! **There are giant concrete arrows across America because of an old airplane mail delivery system! **Have you ever wanted to play a Santa Claus Conquers the Martians tabletop RPG? Well, now you can, with the Santa Claus Conquers the Martians: The Official Series Bible! Yes, you can become a Martian elf and make toys. Seriously! Santa Claus Conquers the Martians: The Official Series Bible is a setting based on a (fictional) television series based on the original film. Players take the role of human, elf, and Martian toymakers, working together to bring peace and understanding while foiling the schemes of naughty people from both planets. It is system-independent, meaning you can use the roleplaying game mechanics of your choice to play it. It’s good for a silly one-shot or a short campaign. The Official Series Bible™ is a format for roleplaying game campaigns. Each setting is called a Pilot, like the first episode of a television series, providing enough information to get started and offering hooks for future adventures, be leaving things open enough for gamemasters to take things in their own direction. All information is presented without rules system information, so you can adapt it to the system of your choice. **Captain Planet is being threatened to be made into a movie…again! Will it die in preproduction like the other two times? Probably. 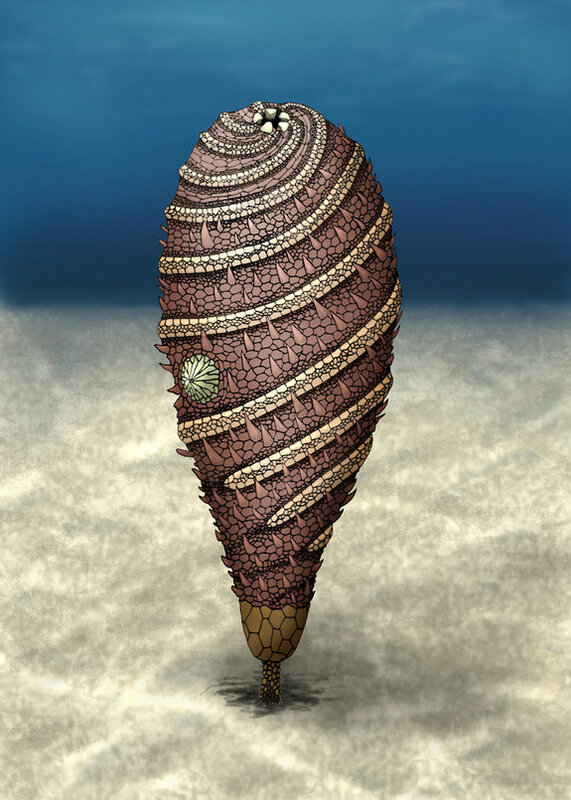 **This cool creature is Helicocystis moroccoensis, and it lived 520 million years ago during the Cambrian explosion, a time when all sorts of new types of life emerged. Helicocystis featured “characteristics that place it as the most primitive echinoderm that has fivefold symmetry”. **The Wolf of Wall Street is based on the memoir by Jordan Belfort, and details his life of excess at a brokerage firm, including corruption, the mob, goldfish eating, dwarf tossing, partying down, and securities fraud. And it looks fan-freaking-tastic from the trailer! That’s all for this round of lots of random crap. Tune in next time for 2 crap 2 random!